Youth: Yanez averaged 8 goals and 4.5 assists during his final two years at Moreno Valley High School and helped lead his U-17 Pateadores Soccer Club to its first ever National Championship during that period. 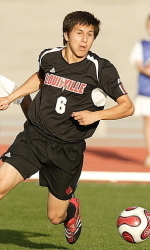 He played college soccer at the University of Louisville, where he earned third-team all-Big East and Team MVP honors in 2007, eventually netting 5 goals in 66 college career appearances. Yanez was drafted in the fourth round (62nd overall) of the 2010 MLS SuperDraft by Columbus Crew. He was signed to the club's final developmental roster spot on 23 March 2010. Yanez was released by Columbus on August 2, 2010 without ever making an appearance for the club. In November 2010, the Louisville Lightning from the Professional Arena Soccer League announced that they had signed Yanez for the 2010-11 season. He joined John Michael Hayden and Thabiso Khumalo as former MLS players on the Lightning roster. On top of being an outstanding player, he is dedicated to giving back to the game. O.T. and his wife Beverly, are also Beast Mode Soccer Trainers in Seattle! Check them out!